At 6:40 p.m. local time Wednesday, a magnitude-8.0 earthquake struck off the coast of Peru, killing hundreds of people and injuring more than a thousand more. At 6:40 p.m. local time Wednesday, a magnitude-8.0 earthquake struck off the coast of central Peru, about 150 kilometers south of Lima, according to the U.S. Geological Survey (USGS). The relatively shallow quake, which is reported to have lasted more than two minutes, has caused massive destruction, and killed more than 510 people and injured an additional 1,500, according to The Associated Press . Rescue workers are still digging through rubble, and expect the death toll to rise. Damage is widespread and likely only beginning to be understood, as many cities and villages are without power or communication, and roads along the mountainous coast of Peru are blocked by giant boulders. It appears the cities of Pisco and Ica, nearest the epicenter, were among the hardest hit. Immediately following the temblor, which was initially reported as a magnitude-7.9, the Pacific Tsunami Warning Center in Hawaii issued a tsunami warning for Peru, Ecuador, Chile, Colombia, Costa Rica and Panama, with tsunami watches issued for the rest of the Pacific Coast of Central America. Earthquakes of this size and depth can generate tsunamis that can strike coasts more than 100 kilometers away, the center said. The center canceled the warnings within a couple of hours, however, and only a small 25-centimeter tsunami was observed near the quake's epicenter. 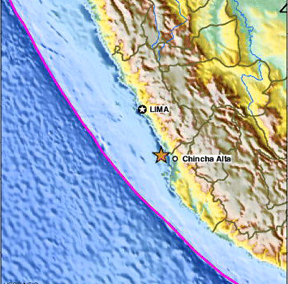 Media reports in the immediate hours following the quake quote residents of Ica and Lima, saying that emergency broadcasts heard over battery-powered radios told them to stay outside their houses and to listen for updates, as a tsunami and more aftershocks could be coming. Indeed, aftershocks have been strong and frequent, with USGS reporting 14 additional quakes above magnitude 5.0. Part of the reason the initial temblor was so destructive is because it occurred at only 30 kilometers deep, along the subduction zone where the Nazca Plate dives beneath the South American Plate. Peruvian media reports have also suggested that the quake also shook the ground for an unusually long time period, according to CNN reports. The last major earthquake to strike Peru occurred in September 2005, when a magnitude-7.5 quake hit northern Peru, killing four people in remote villages. Coastal South America, where the Nazca and South American tectonic plates meet, has a history of very large earthquakes. The epicenter of yesterday's earthquake was near the source of two magnitude-8 earthquakes that occurred in 1908 and 1974, according to USGS. Yesterday's temblor was just south of the source of a magnitude-8.2 earthquake that occurred in northern Peru in 1966, and just north of the magnitude-8.3 earthquake that occurred in 2001 near Arequipa, USGS says. The largest earthquake observed along the coast of Peru is a magnitude-9 temblor that occurred in 1868, and produced a tsunami that killed several thousand people. Meanwhile, the Tsunami Warning Center issued another tsunami warning today, thanks to a magnitude-6.7 quake that struck about 1.8 kilometers below the Pacific off the Solomon Islands at 7:39 p.m. local time. The last major earthquake to hit the Solomons, an archipelago north of Australia, was a magnitude-8.0 quake that struck in April, causing a local several-meter-high tsunami. Several towns were devastated and more than a dozen people were killed. Like Peru, the Solomon Islands are part of the so-called Ring of Fire, a tectonically and volcanologically active area that rims the Pacific Ocean.